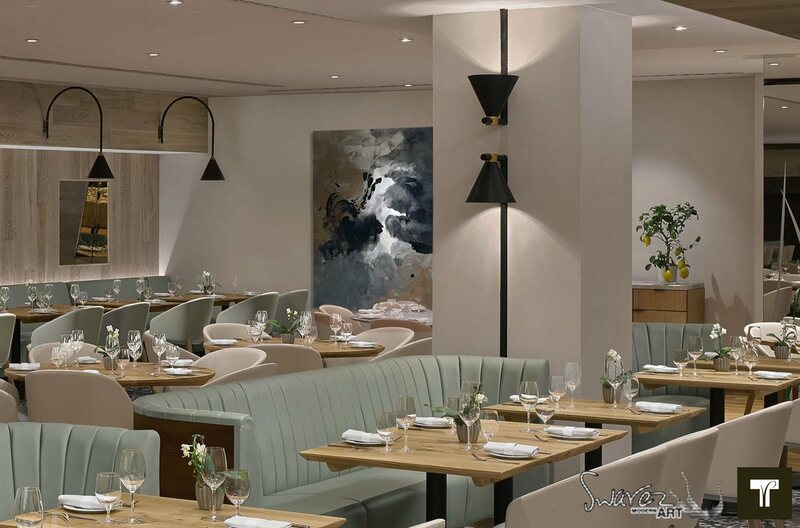 It’s a great honour to have put three of my original paintings into the newly remodeled restaurant of world-renowned chef Theo Randall, at The InterContinental London Park Lane. 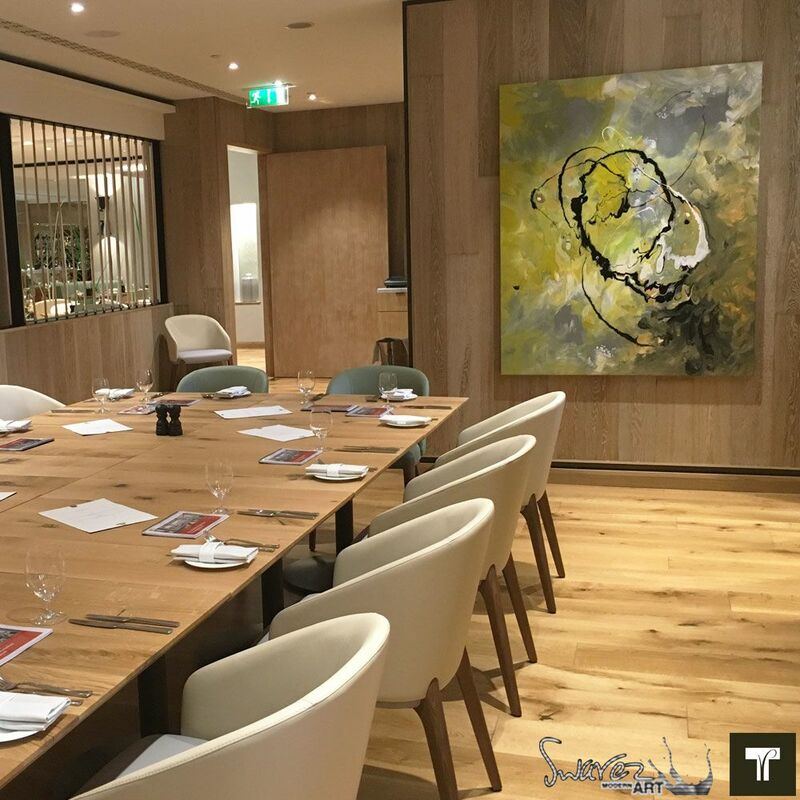 Located away to the right and next to the main dining area this part of the restaurant caters for larger groups of diners in the Private Dining Area. 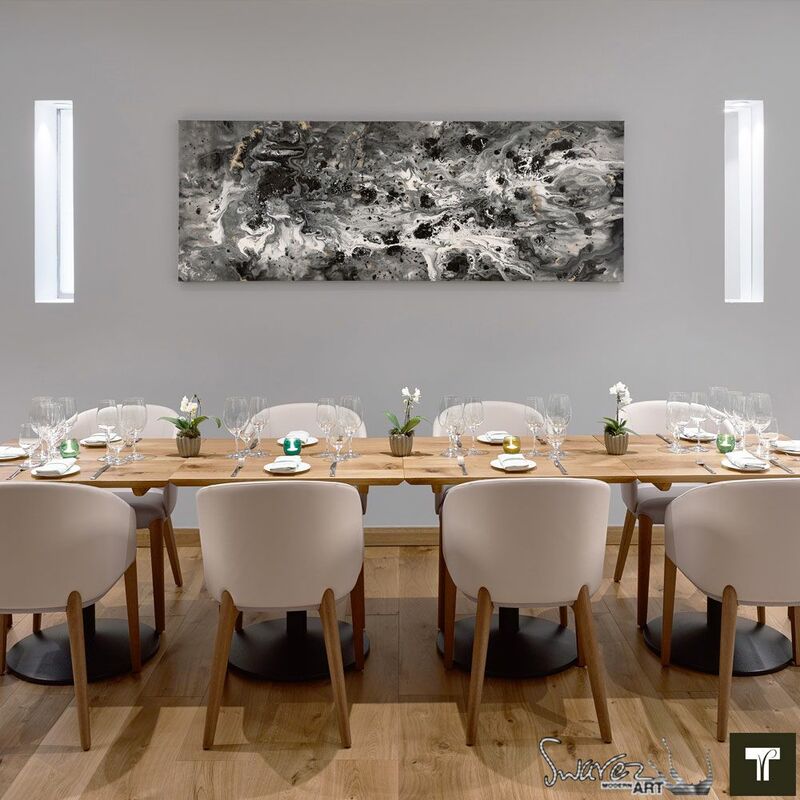 A subtle grey finish to the plaster-work, clever use of natural light that’s been cut away through the walls and an exquisite finish to the interior furniture helps to bring out all the drama and movement in the painting. Never overpowering but just enough individuality to know you’re somewhere a bit special. 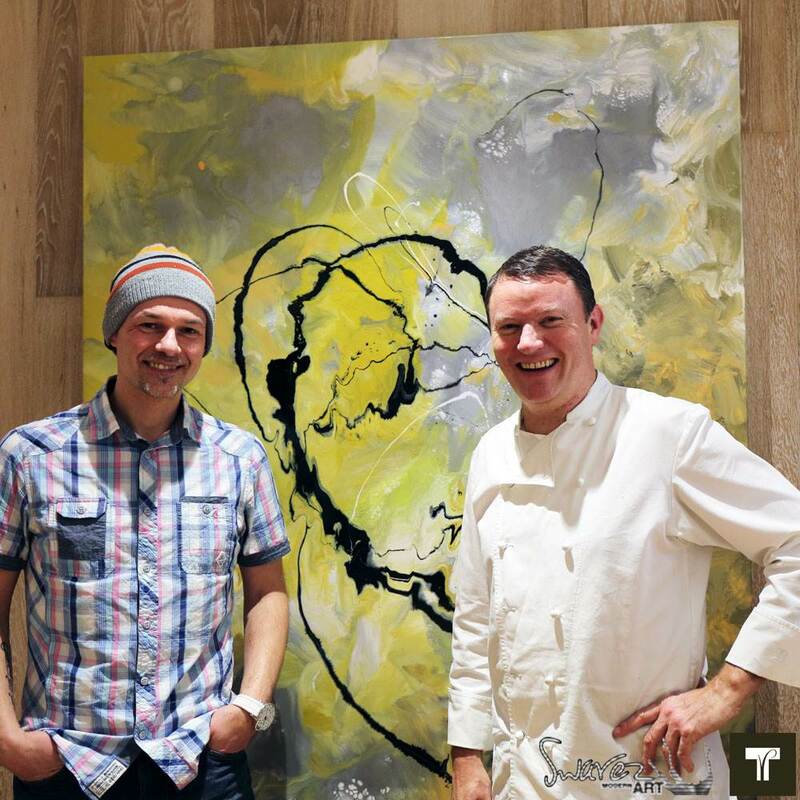 This painting hangs in the Private Dining Area. 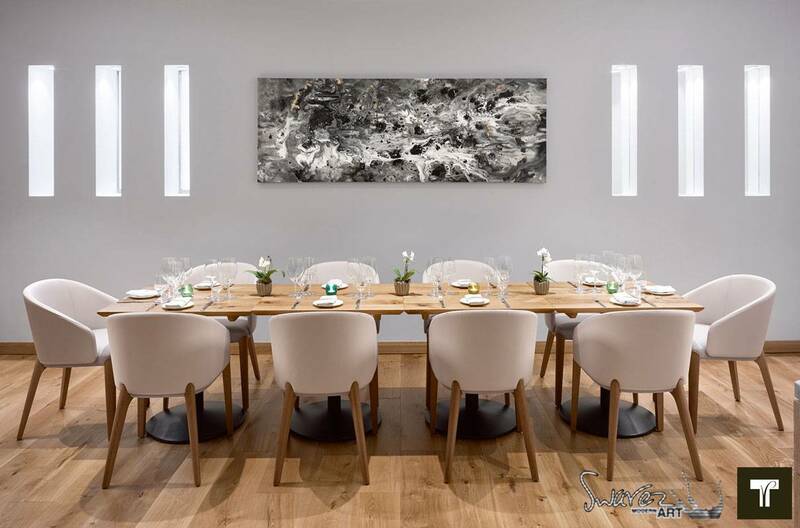 An exclusive part of the restaurant reserved for private tastings and other functions. Of particular note is the beautiful wood paneling on the walls; fabulously complimented by the rich and light tones in the painting. The base is a mustard and silver blend with accents of white, cream and black over the top. Natural light and the reflectiveness of the mirror means you can pretty much see the painting from most angles. 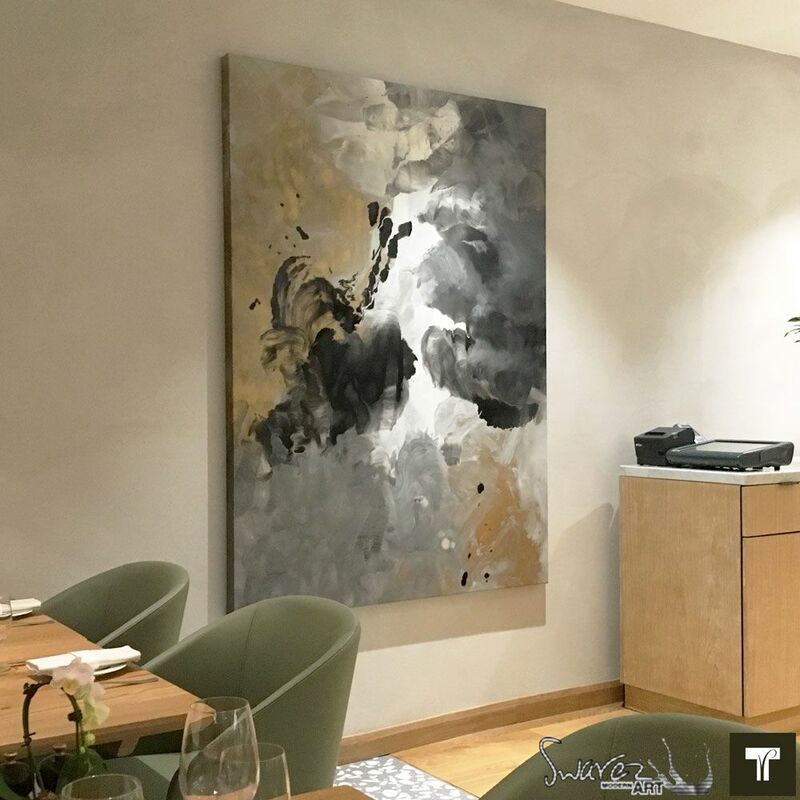 This is perhaps the one piece of art that will get seen the most and can be viewed across the main dining area, in full view. Diners can see it from the moment they enter. 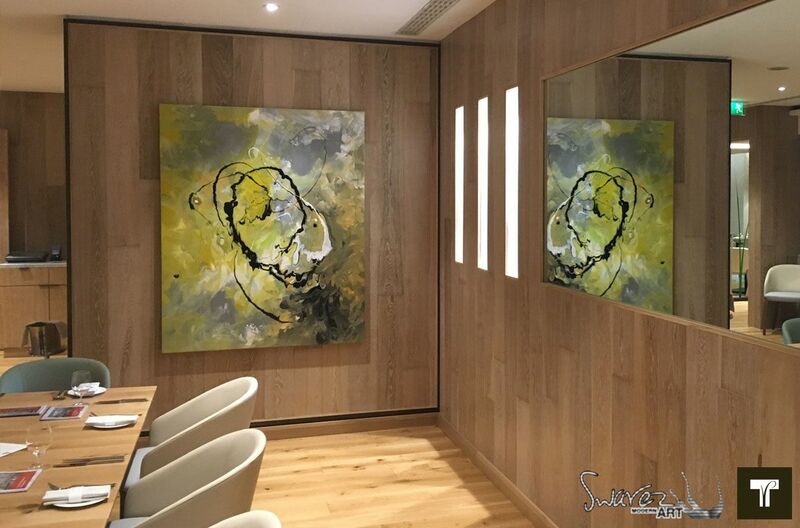 The bold black, gold and grey tones and those big shapes make it not only blend effortlessly into its surroundings but to also stand out and be noticed; quite a clever trick from a piece of art. In part it’s thanks to the clever use of black – it’s the bit that grounds the whole piece. HAVE YOU GOT SOMETHING IN MIND? 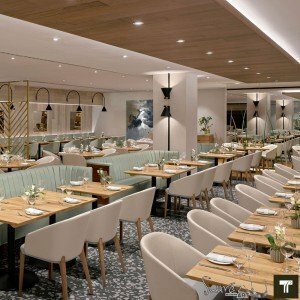 If you are a restaurant owner, or you have some walls in your business that are crying out for something to fill them, then why not get in touch? It really doesn’t matter what kind of ideas you have, I can help you turn them into a reality. My bespoke service isn’t eye-wateringly expensive but will deliver on every level. I paint without obligation and never pressure you into anything. If I can do this for Theo and his team then think what I may be able to do for you? One wall, two walls, a dozen – drop me a line and see why I’m on the verge of something remarkable.